There are a growing number of organizations looking to encourage workers in the startup sector to give back to the communities around them. Earlier in the year we wrote about #charity, which links up charitable techies with non-profits who could put their free time and tech skills to positive use. Now we’ve come across Startups Give Back — a philanthropy movement helping startups lend a hand to nearby non-profits and social causes. Startups Give Back partners with companies who want to contribute to positive change in the world. 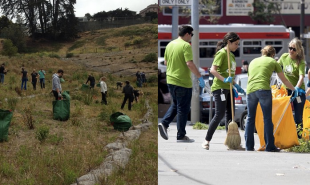 The movement organizes regular events — such as beach cleanups, weed pulling or food packing at SF Food Bank— and startups can register their team to attend an event where they will meet and work alongside other likeminded small businesses — combining volunteering with networking opportunities. The company is based in San Francisco and currently all events take place in the Bay area, but there are plans to expand into other cities in the near future. Is this something that could work all over the US and beyond?